This is a dwarf Japanese Maple with a difference, Acer palmatum ‘Mikawa Yatsubusa’ is upright with very attractive green foliage. The leaves are very closely spaced, which creates a wonderful layered effect. It is a spreading type and will eventually grow wider than it will tall in most locations. Five lobed leaves green from spring are a mid lime green when new, as we move through to summer they turn to deeper green, as the season progresses they turn to a bright orange with red margins on the leaf tips. What makes this such an attractive plant are the very short internode lengths, because of this, the individual leaves ‘pile up’ on top of each other in clumps. Described as a tree made up of little trees, this is a great sculptural plant. Autumn colour is a buttery yellow to red depending on the climate. More red will be apparent in cooler climates. Best planted in a well drained humus rich soil, Acer palmatum ‘Mikawa Yatsubusa’ also prefers a little shade in the afternoon. Growth rate is regarded as slow, reaching around 2 metres in 8 – 10 years. Regular applications of a general purpose slow release fertiliser will be required if container grown. Mulch around Acer palmatum ‘Mikawa Yatsubusa’ to maintain a cool moist root run. This a very attractive, and rare maple. A good growth habit, and a stunning feature plant. It works well in containers where its natural growth habit makes it most suited. Being slow growing, this is the perfect specimen for growing in a container, long term, and a wonderful feature for any garden. It is particularly effective in a Japanese style garden, and well suited to growing near a pond or water feature where it can be allowed to overhang the water. Grow it as a specimen plant with a little space around it where its wonderful form can be appreciated. 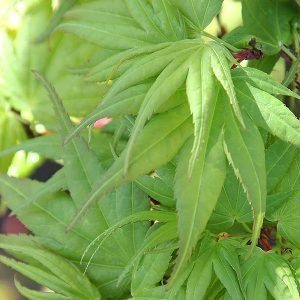 Acer palmatum ‘Mikawa Yatsubusa’ is available for sale from the following nurseries.